Having introduced the Endeavour Tourbillon Concept in stainless steel earlier this year, H. Moser & Cie. now installs its signature tourbillon in the water-resistant, stainless steel Pioneer case, keeping the same movement but making the watch significantly more affordable. With the Pioneer line having been conceived as a line of luxe sports watches, the Pioneer Tourbillon is substantial in size at 42.8mm in diameter and 10.8mm high, topped by a domed sapphire crystal. The case is characterised by pronounced concave flanks finished in fine, vertical fluting, a distinct feature of the Pioneer line. And the case also has a screw-down crown and is depth rated to 120m. 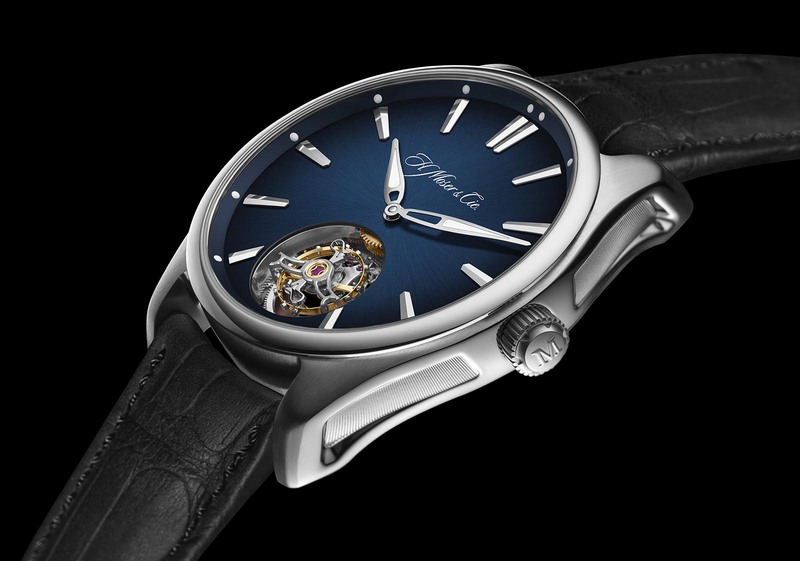 Typical of Moser’s styling, the dial is in midnight blue fumé, a graduated finish that darkens towards the edges. It has tapered steel indices for the hours, along with luminous dots on the flange, leaf-shaped luminous hands, and the centrepiece – a flying tourbillon at six o’clock. 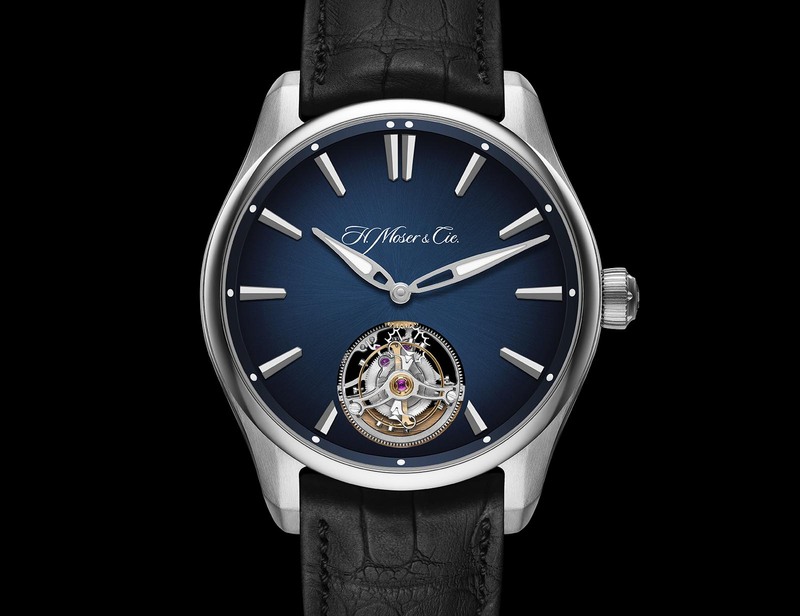 Like many of Moser’s top of the line watches, the escapement – which is a tourbillon regulator – is modular. That means the module is regulated prior to being installed and can therefore be easily swapped for a freshly regulated module during servicing, expediting the turnaround time. Another feature it shares with Moser’s other high-end movements is a Straumann double hairspring, produced in-house by Moser’s associate company, Precision Engineering AG. Stacked one over the other, the twin flat hairsprings operate in opposition to one another for better concentricity, with positional errors in each hairspring being averaged out, and therefore improving accuracy and isochronism. 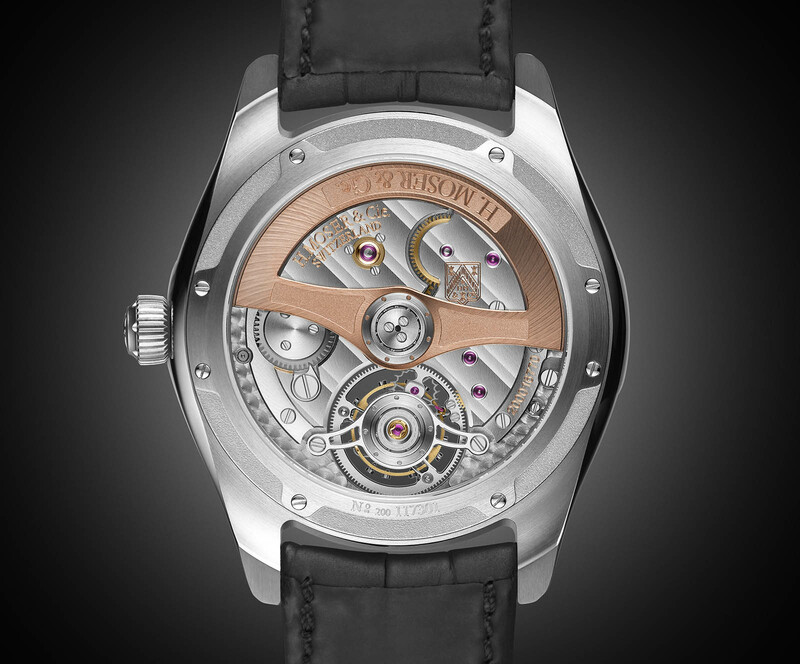 The movement is the same self-winding HMC 804 found in the Endeavour Tourbillon Concept. It has a three-day power reserve and single barrel, wound bi-directionally by an 18k red gold rotor, all of which is visible through its sapphire back. 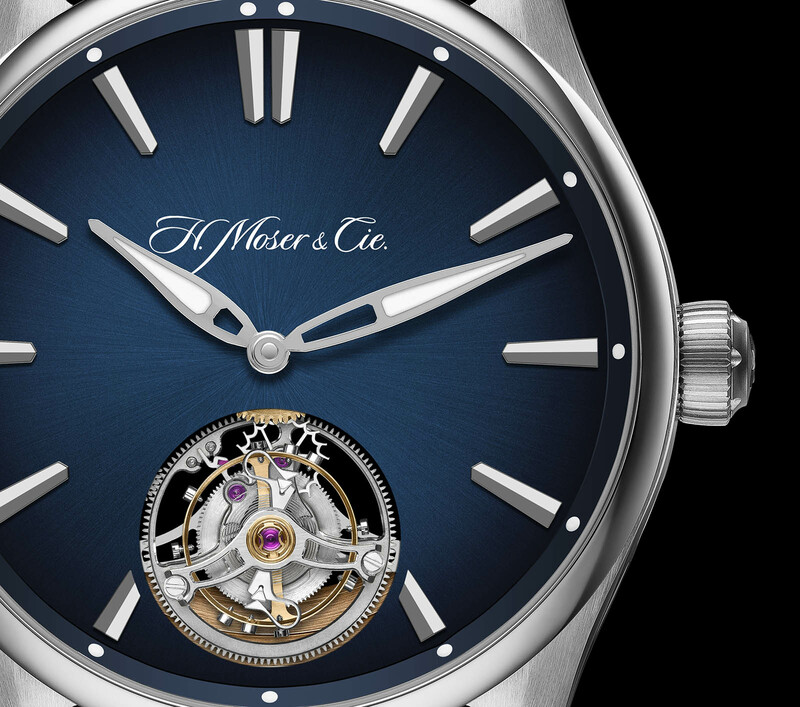 The H. Moser & Cie. Pioneer Tourbillon (ref. 3804-1201) is priced at US$49,900 and is limited to 50 pieces. The Pioneer Perpetual Calendar is water-resistant and priced at US$40,000. Powered by the new HMC 200 movement, which is also offered in four new 18k gold models. An novel take on the wandering hours.